American cartoonist and publisher born in Banbury, England, on April 28, 1856. Bernard Gillam moved with his family to the United States in 1866, shortly after the Civil War’s end, and settled in New York. He always displayed an inclination toward art, and a perhaps apocryphal story has the famous preacher Henry Ward Beecher encountering the impoverished Gillam in his youth and sponsoring his art training. (If the story is true, Gillam did not respond in kind—or with kindness—as he and fellow cartoonists were later to vilify Beecher mercilessly.) His first job was as a copyist in a lawyer’s office, and he studied engraving at the same time. Gillam sold his first cartoon in 1876 and was soon contributing ideas and cartoons to two of the nation’s leading cartoon markets, the Leslie publications and the New York Graphic. When James A. Wales left Puck magazine to found Judge in 1881, Joseph Keppler needed a full-time political cartoonist to balance the social humor in his pages. When he plucked Gillam from Leslie’s he was following a pattern: Keppler and Opper, another Puck mainstay, were alumni of the Leslie’s shop. The British-born cartoonist added a new element to the predominantly German Puck staff and soon became one of its stars through his powerful cartoons. He is most remembered for his vicious anti-Blaine cartoons in the American presidential campaign of 1884 (such as the Tatooed Man, a concept used by Keppler in similar contexts years before), although Gillam reportedly took little interest in politics (when he did, however, he admitted to Republicanism). He is recorded as actually having voted for Blaine. In 1886, after Wales made a decided failure of running Judge and sold it to entrepreneur William J. Arkell, the latter lured Gillam away from Puck with a half-interest in the magazine. Eugene Zimmerman also followed Gillam, and it was rumored that the Republican party itself invested heavily in Judge to make it a counterpart to Puck. Gillam was now able to give his crusades full range, although the fire of the 1884 campaign never returned (as was true with Keppler). Judge’s position was somewhat obscured as it straddled the Harrison-Blaine fence, but under Gillam it remained obdurately anti-Cleveland. 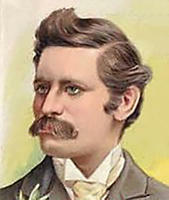 Gillam died in his prime at Canajoharie, New York, on January 19, 1896. Bernard Gillam was for a short period the most partisan cartoonist of his day and seemed sure to earn the mantle passed by Nast to Keppler. His fame was great and his cartoons bitingly powerful, but his most famous creations were simple assignments designed in Puck’s editorial sessions. His cartoons were technically proficient and carefully detailed, and perhaps it was their stiff, mechanical nature that kept them from achieving Keppler’s verve and Opper’s native humor. Lest he be judged too harshly, it should be noted that Gillam is in the league with the early giants because his vision was great and his executions bold. He never shied from difficult subjects, artistically or thematically. His stiff, slashing lines and forthright use of color lent a solidity to the art of the cartoon and accomplished the task of every cartoonist — to command attention.